The shopping list and initial thoughts are here, and final prep and serving are here. Yesterday, before playing some GoW2 online and subsequently going out to see the Ravens get beat down... 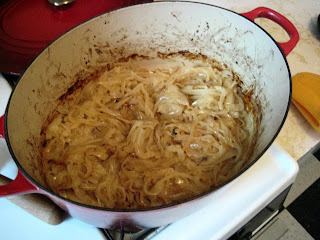 I started my latest attempt at French Onion soup. 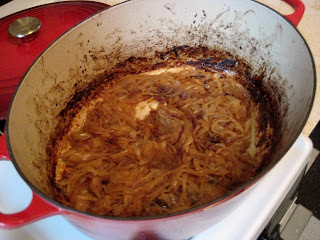 As mentioned previously, the idea of this Cook's Illustrated recipe is that you can cook the onions down in the oven more slowly so that you don't have to hover over the pot and worry about burning. The drawback being that cooking the onions now takes 2 and 1/2 hours before you even start making the actual soup... so instead of making the soup all in one go, I decided to follow the suggestion of the recipe and do the cook down before cooling and refrigerating the onions. That'll keep for a couple days, so I can eat some leftovers that are (hopefully not) rotting in my fridge before I finish the soup later this week. You need a big oven safe dutch oven for this. The recipe says you need at least 7 quarts, and my 6.75 quart one was filled to the brim... so you can't really skimp much there. 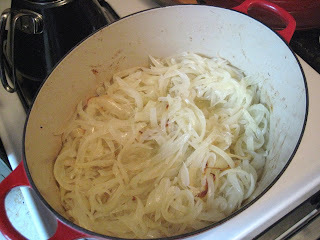 However, the onions reduce a ton so you could certainly get away with two smaller pots and then after your first deglaze combine them all into your biggest. First up, preheat your oven to 400 degrees, and put a shelf at the lower middle position... making sure there is room to accommodate the dutch oven. 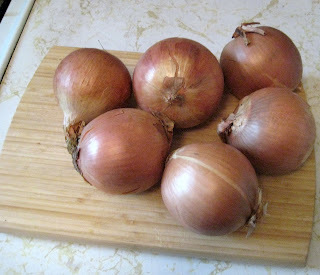 Then it's time to slice up 6 large yellow onions(not sweet), which yes, involves weeping like a little baby. 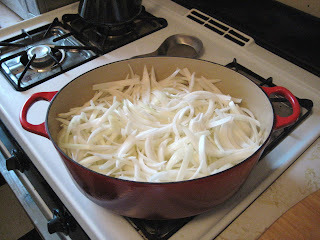 Cook's was very firm in demanding that the onions be 1/4" sliced "pole to pole" (i.e. with the grain or root to stem) which I think is somewhat "new school" in onion slicing techniques. I can't complain as it did lead to pretty uniform slices. Then I just sprinkled with a teaspoon of salt, covered it, and put it the oven for an hour. As you can see they've already cooked down quite a bit at the hour mark, but not much browning going on yet. So stir all that up and scrape everything down the sides before putting it back into the oven with the lid ajar. After another hour, pull it out of the oven and do the stir-scrape thing. So is that over browned? Not really, since I have to do a lot of browning on the stove top still, but I may have started them further onto that process than the recipe authors intended... so I'll just have to be careful I don't burn them before that first deglaze... I'll have to be careful anyway, since I'll be starting with cold onions when I put them on the stove, so the cooking times will be off. I'll update with the results in a few days.